We featured the standard Ox in mini form some time back, but you can also get the equally classic Converse All Star Hi Infants online too. Basically, if you are looking for a very cool and timeless piece of footwear, this is it and has been for the best part of 100 years (with one or two design tweaks). 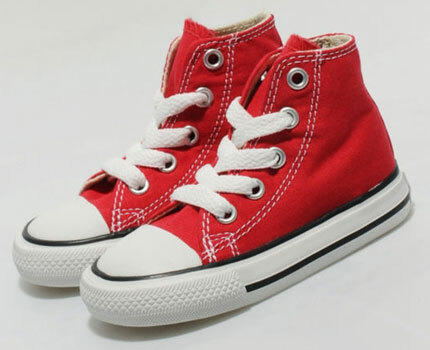 The infants version shrinks everything down a bit, but still offers a canvas upper in red or black, white vulcanised sole with sidewall striping and rubber toe cap. There is also branding on the heel, as you might expect. Sizes are 3 through to 9 and the price is £24.